At head of title: 97th Congress, 2d session, Joint committee print. 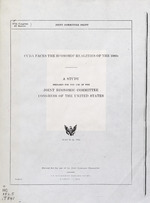 prepared for the use of the Joint Economic Committee, Congress of the United States. U) . . . . . .
HMN TY IESs, WIS.. CHAIRMAN nROSE W. JPEN. tOWA. LF M. kMAILTON WI.AM V. POTH, S., C.
DRILLS W. LONG E. -JAM . ... .......Y. Cottgrvo of th niteb btatt ...-.. ..
7RCDzRICKw.RICXMON vUILN tL). .II.IUY4 PA.t HAWKINS. r.
uArAr M. NrCuE..M AS. JOINT ECONOM IC COMM ITTEE rO Otr TEx. J,-N .. # IL.COT. C I. ( CATED M*RWANT TO S VI)j OF P*Jlj LW MA, 7ITH CONGRESS) WILLIAM WlesMIit CHALMEIs P. W 1JE, O OWARD U. KENNY, MLASS. JAMES K. GAUIMA. WASHINGTON, D.C. 20510 PA. & W M6. in Soviet Economics of the Congressional Research Service. Dr. Kent H.
Hughes supervised the study for the Committee. range of goods that would lead to a transformation of the Cuban economy. In fact, Cuban dependence on sugar exports has grown rather than diminished. over the next five years will do little to offset the impact of U.S.
drop in earnings from sugar exports. Joint Economic Committee or its individual Members. *OGan W. JmszN. IOWA, VICK CHAINMA WrUJIA V. "0". .M., 0e. JAIE A5Wat, S. Da". TKYVK 0. SDM. S IDAIwI PAUlA *WX..I. rLA. MACmC MAr:NLV. A. LLOYD brHTSC.. TCX. WILiAM PROXMIKE. Wi8. COWAok M. K*ICOY. M6ASS. PAuL .AMSAWS.I MD. Realities of the 1980s." The analysis of the economic outlook for Cuba was prepared by Lawrence H. Theriot, Office of East-West Policy and Planning, International Trade Administration, U.S. Department of Commerce. It is one of several studies that you requested in conjunction with the recently released JEC study, "East-West Commercial Relations: A Congressional Dialogue with the Reagan Administration." The study was supervised for the Committee by Dr. Kent H. Hughes. All the views expressed herein represent those of the authors and do not necessarily reflect the views of the JEC or any of its Members. This East-West Trade Policy Staff Paper should not be construed as a statement of U.S. Department of Commerce policy. (basically the Soviet model) that is perpetuating serious problems. well-educated, rapidly growing labor force. massive economic assist-ance provided by the Soviet Union, with the result that Cuba now relies on the U.S.S.R. and other members of CMEA for three-fourths of its world trade. imports obtained fram the West. Noncommunist countries are still the only source for sce major products' as well as the preferred source (given sufficient hard currency) for most of Cuba's imports. limited variety of generally poor quality products has retarded Cuban economic performance. Consequently, after a decade of integration into CMEA, the basic structure of the Cuban economy is unchanged and dependence on sugar has increased compared to pre-revolution levels. Perhaps most important, Havana must rely on subsidized Soviet imports for 99 percent of its oil needs. revolution's key goal of econanic equality has actually perpetuated an equalitarian austerity that offers workers little motivation. potential implications for the long term survival of the revolution. ffcam its other allies for increased deliveries of key resources, especially oil and food. Thus, in the period to 1985, Castro for the first time most likely will confront a slcw-down in the real volume of Soviet aid which may well peak and level off or perhaps even decline. Oil is likely to be the key focus of concern for both Havana and Mcscow. With production leveling off and deliveries to Eastern Europe fixed at 1980 levels, Moscow will be hard pressed to provide Havana the increased oil premised for 1985. Moreover, even with imports in promised volumes, Cuba will not be able to meet its minimal production goals for key sectors, including electrical power. servicing Cuba's large debt ($2.6 billion) will also intensify as principal payments fall due in substantial volume. austerity scenario will prove the best-outcome Havana can anticipate. On his 54th birthday in 1980, Fidel Castro could reflect on twenty' years of unique social 'experiment in the Western Hemisphere. At the outset, the Cuban revolution set lofty goals of socio-economic egalitarianism and gathered widespread support from most of the population with the promise of both an improved living standard and a new pride o f nationalism. multifaceted social, economic, and political problems of development. Second Cuba has probably exhausted the gains as perceived by the population from Installation of socialist egalitaranism and has become more and more deeply involved in and dependent on trade with and subsidies from far distant economies. Havana therefore faces crucial economic decisions in the next half decade which will set development prospects long into the future, including, probably the post-Castro generation. population with a strong sense of national identification. meet minimal investment and consumption needs. 0 Real economic growth has barely exceeded population growth. bureaucracy, and poor labor productivity. Moreover, some of the revolution's "accomplishments" have themselves generated adverse economic consequences which cause Havana increasing difficulties. efficiency necessary for economic advance. workers could continue to retard productivity. volatility in hard currency trade which remains dominated by. in their expectations for improvement. the point where productivity is dismal. identification with violent revolutionary struggle in the Third World and its close association with Soviet foreign policy objectives, have prejudiced relations with the U.S.
dependence on CMEA, especially the USSR. The role of foreign trade in Cuban economic development can hardly be overemphasized. The island based economy is highly open to trade, with global exports and imports accounting for 34 and 36 percent, respectively, of Cuban GDP. The trade impact of Havana's heavy reorientation from the U.S. to CMEA has been dramatic. Prior to the revolution, 75 percent of exports and 65 percent of imports were with in trade with the U.S. Twenty years later CMEA countries accounted for about 75 percent of Cuba's foreign trade, with Cuba's dominant trade partner, the Soviet Union, alone accounting for 65 percent of total trade turnover. (See Table 1). Cuban trade within CMEA.essentially involves a barter exchange of sugar, nickel, and citrus for a variety of raw materials, industrial equipment, and some consumer products, including food. The specific quantities of product traded with each country are prearranged in annual trade plans. tuba's status as-a developing country affords it highly subsidized trade prices from its CMEA partners. During the 1970s, Cuban economic relations with CMEA were developed according to the principle of "international specialization". Unfortunately, that principle perpetuated and deepened Cuba's historic dependency on sugar which now accounts for 83 percent of Havana's global exports by value compared to 80 percent in 1957. Notwithstanding dominance by CMEA countries, especially the USSR, an essential portion of Cuba trade turnover in the last five years (averaging 25-30 percent) has been oriented to the West. Reflecting sharp swings in world sugar prices, Cuban hard currency earnings have fluctuated widely and made planning for imports from noncommunist countries difficult. After reaching $1.6 billion (70 percent from sugar)in 1975, hard currency exports declined to a low of $.8 billion in 1977 before rising to a new high of $1.8 billion in 1980. (See Table 2). Estadistico (1970), Cuba: Economic Development and Prospects. (Banco Nacional de Cuba, 1978), Comercio Exterior (1958). 1/ U.N. data, adjustod to includo augar exports to U.S.S.R. paid in hard currency. 2/ U.N. data, adjusted to exclude imports of Canadian wheat and flour paid for by U.S.S.R. 3/ Banco Nacional De Cuba, August 1981. In spite of Havana's reliance on intra-CMEA trade, hard currency export earnings will continue to be a key determinant of Cuba's economic future. productivity, can be obtained only for hard currency. manufacturing sectors are generally not available in CMEA. to develop new manufacturing industries. is owed Western commercial banks, is reaching its upper limits. Both Western banks and Western governments are reluctant to increase their lending exposure, particularly while Cuban political adventurism continues. With access to new loans limited, Cuba's hard currency resources will, for the forseeable future, be limited to earnings on exports to the West, limited income from tourism, and Soviet hard currency aid. A detailed outlook for Cuban hard currency exports and debt under alternative scenarios of increased integration with CMEA on the one hand and increased integration with the West on the other are presented below. Effective management Cuba's foreign trade is a formidable task complicated on the one hand by the rigidities of trading within CMEA and on the other by the volatility of hard currency exports tied to swings in world sugar prices. These inherent complexities have also been aggravated by the 20 years of a U.S. trade embargo. The dislocations precipitated in the 1960s by the forced restructuring of trade away from the U.S. market are well documented. The! impact of the embargo may seem lessened over time as Cuba's industrial base was retooled with equipment supplied by CMEA countries and, since the mid 1970s, through trade with Western countries such as Japan, Canada and others. However, the continued denial of Cuban access to U.S. trade and financial markets has effectively restricted the potential for trade and investment by other Western countries and narrowly circumscribed Havana's options for economic development, forcing increased dependence on Cr'IEA.. Thus, the U.S. embargo has been and continues to be not only major, but a crucial impediment to Cuba's efforts at diversifying'and expanding its haru currency trade, the key to improved economic growth and living standards. indeed, it is fair to say that the U.S. embargo has condemned and will continue to condemn the Cuban economy to continued stagnation, with occasional temporary blips of modest improvement tied to the sugar price increases. Cuba's foreign t 'rade deficiencies have both resulted from and contributed to its domestic economic difficulties. Since 1975, Havana's economic planners have, with few exceptions, failed to maintain increases in production of key export products. Outputs of sugar, tobacco, fish, and nickel have been erratic in recent years and fallen far short of production targets set in 1976. Among major five-year plan goals, Cuba was successful in meeting production goals only for eggs and electric power. (See Table 3). Combined with volatile price fluctuations of key exports (especially sugar) the re-sult has been wide fluctuations in but a general shortage hard currency available for investment to expand and diversify Cuba's export production base. The vicious circle therefore continues. In his December 1980 report to the Second Party Congress, Castro described the Second Five-Year Plan 1981-85 as "realistic". The plan called for a five percent annual increase "general economic growth", with continued emphasis-on export expansion and import substitution in order to reduce "foreign dependence". Overall investment will increase 15-20 percent over the five year period, down somewhat from the 1976-80 plan, and will be concentrated on completing projects already underway. Castro also claimed that the plan is "more responsive to the needs of the people" since real per capital income is set to increase 15-20 percent by 1985.To achieve that goal vis-a-vis an overall population growth rate of 1.6 percent, nominal economic growth will have to reach, 5.5-6.5 percent annually. Daily caloric .intake per capita i s scheduled to increase to 3,155, a level approaching that of the Soviet Union, from the current level of 2,800. Cuba's housing crisis is to 'be alleviated by construction of 40,000 new housing units each year compared to current annual production of 15,000 units. After sugar, probably the key indicator of feasibility in the Second Plan is the goal for electrical power, the essential input for much of the nonsugar economy. Installed generating capacity is to increase from the current 2,000 to 3,000-3,200 megawatts. New power plants apparently are to.-be thermoelectric, oil burning units, since work on the 440 megawatt nuclear plant "will continue" rather than be completed, according to Castro. In spite of the hoped for 50 percent increase in electrical generating capacity, Castro cautioned that "difficulties during peak period. :* will continue through 1985. Meeting these higher (but apparently minimal) power needs will be exceedingly difficult in view of a planned increase of only 22 percent in deliveries of Soviet oil to cover the needs of existing, as well as new, electric power plants. Furthermore, Castro noted without clarification, that only "a 10-15 percent growth in fuel --is,-expected" over the five year period. While the Second *Five-Year Plan avoids the wildly optimistic targets set for the First Plan in 1976 and is, in this sense, "realistic", achieving the high output levels anticipated for 1985 in crucial sectors will require extraordinary increases in domestic productivity, unusual reliability in deliveries from the U.S.S.R. and plenty of old-fashioned good luck! and tied to Moscow by massive subsidies. In addition, Havana faces unprecedented economic pressures in the areas of energy, productivity, and unemployment. Moreover, popular expectations for an improved living standard, while modest, have been stimulated by the relative prosperity of 1974-75, and increased awareness of the outside world capped by the mass arrival of obviously prosperous U.S. relatives during 1979-80.
in the past, consistent increases in economic did from Moscow have a'-lowed the Cuban leadership to postpone adjustment to the realities of economic development which Cuba, like all the non-oil developing countries, now confronts. in. theory, the Soviet economic model, adapted to Cuba, promised to e4lminate the unemployment and inflation that plague market economies. But theory has not matched practice. Cuba faces substantial structural unemployment as its agricultural based economy is incapable of generating sufficient jobs to absorb a growing, relatively well educated, labor force. On the price side, suppressed inflation has long been evidenced by rationing, queueing for essential products and a widespread black market. -::tent of shortage and suppressed inflation. Economic reassessment and institutional revision have been attempted before as Havana searched for solutions in the mid-1960s and after the disastrous 1970 attempt to harvest 10 million tons of sugar. However, in past crises Soviet largesse has always been available to offset failures and defuse pressures for any substantial change in the system. But Cuba may be less fortunate in the 1980s, as its continuing economic difficulties may coincide with a leveling off of Soviet assistance forced by competing demands from other allies. The results of the Second Party Congress confirm that in recent months the Cuban leadership has devoted substantial attention to economic issues and is searching more intently than ever before for options and alternatives. The outlook for Soviet assistance will, as in the past, be crucial to Cuba's economic future. Fidel Castro in his report to the Congress provided an optimistic assessment for economic relations with Moscow through 1985. Our more pessimistic assessment follows. Cuba's economic ties to the USSR, the epitome of a client-patron relationship, have deepened significantly since the mid-1970s. Soviet economic assistance excluding military aid to Cuba has more than quadrupled since 1974, amounting to about $3 billion in 1979. (See Table 4). The sharp escalation in Soviet economic aid was necessitated on the one hand by continued (until early 1980) depressed sugar prices following the record high in 1974, and on the other, by sharp increases in oil prices. world price--for 3.8 million tons of Cuban sugar. current world price--for about 18,000 tons of Cuban nickel. The impact of these trade price subsidies is dramatically demonstrated if Cuban trade accounts are adjusted to eliminate their effects. (See table 5). Without subsidized prices from Moscow, Cuba's modest 1978 global trade deficit of $187 million would-have been $2.8 billion. In addition, Moscow has significantly augmented Cuban foreign exchange earnings in recent years with the reinstitution in 1975 of extra protocol hard currency purchases of Cuban sugar. These purchases, which are made at world prices, have totalled about $970 million over the 1975-79 period. The sugar and nickel subsidies are estimted as the diftrence between the values of sugar and nickel exports to the USSR and the value of these exports if sold on the world market. They are considered a grant and not subject to repayment. The petroleum subsidy reflects the difference between the value of petroleum purchased from the USSR and the value of thene Importa ait world pricon. It is considered a grant and not subject to repayment. - Estimates based on official Cuban and Soviet trade data. b See table 35 for derivation of Soviet price subsidies. Sources: Ar ario Enadistico de Cuba (1972. 1976, 1978), Cuba Economic Development and Prospects (Banco Nacional de Cuba. 1978), Vr,.shnyaya Torgovlya USSR (1978). percent of Cuba's nickel exports. On the Cuban domestic scene, over 160 industrial and other projects have been completed with Soviet aid. These projects account for 10 percent of total Cuban industrial production, including 30 percent of electric power output, 95 percent of steel production, 100 percent of sheet metal output, 12 percent of sugar milling capacity, and the bulk of Cuba's sugar harvest mechanization. Under the 1976-80 Five-Year Plan, the USSR assisted development of projects in the electric power, nickel, sugar, petroleum, ferrous and nonferrous metallurgical, building materials, and transport sectors. These were carried out with some $1.7 8illion in Soviet aid extended at the beginning of the Five-Year Plan and overseen by an estimated 6,000 Soviet technicians in Cuba in compliance with an Intergovernmental Economic and Technical Cooperation Agreement. Viewed in macroeconomic terms, the burden to the Soviet economy of subsidizing its Cuban client appears to have been relatively insignificant. In 1979, Soviet econon'c support of $3 billion equaled only 0.4 percent of Soviet GNP. Even in the petroleum sector, Soviet deliveries to Cuba in 1979 accounted for only 2 percent of Soviet oil production, even though the total was equivalent to 13 percent of USSR exports to CMEA. However,- it is in terms of hard currency that the burden of supporting Havana is most usefully viewed. The hard currency costs to the Soviets have been rising sharply since the mid-1970s, and will likely continue to increase rapidly for the forseeable future. Over the 1960-73 period these costs amounted to a modest $1.5 billion, or only about $100 million annually, largely because of low world oil prices and Soviet reexport for hard currency of Cuban sugar after refinement in the USSR. (See table 6) Since 1974, however, soaring world oil and grain prices and the resumption of Soviet hard currency purchases of Cuban sugar (and simultaneous discontinuance of Soviet reexports) have driven hard currency costs steadily upward. Supporting Havana cost Moscow $1.5 billion in 1979 in direct hard currency outlays or lost export earnings--the equivalent of about 6 percent of Soviet hard currency exports. moreover, the future hard currency cost of Soviet aid can only increase in step with the growing opportunity cost of supplying oil to Cuba, rather than selling it for hard currency. which could have been sold elsewhere for hard currency. According to Castro, Moscow has "guaranteed" delivery of 61 million metric tons of crude oil and refined products during 1981-85, a 26 percent increase over the 48.5 million tons supplied 1976-80. While specifics on pricing are not available, the hard currency export earnings forgone by Moscow will be massive. For example, valued at a world market price of $35 a barrel, 61 million tons of oil would generate $15.5 billion in Soviet hard currency earnings. Similarly, if oil exports of 14.4 million tons promised Cuba in 1985 are actually delivered Moscow would forego $5.8 billion in hard currency earnings that year alone, assuming world oil prices rise to $55 a barrel. o Leveling off and possibly declining Soviet oil production. products for nearly one-half of hard currency earnings. tually delivered, exports to Cuba would rise to almost 18 percent of those to Eastern Europe. In view of these foreign and domestic constraints, Moscow clearly faces uncertainties in meeting its "guarantees" of oil to Havana through 1985. Accordingly, annual Cuban-Soviet bilateral trade negotiations can be expected to become increasingly complicated and acrimonious in dealing not only with oil, but with all commodities that necessitate hard currency expenditure by Moscow. An unusual four months delay in signing the 1980 trade protocol may indicate the start of problems that are sure to become more contentious. Faced with difficult choices, Moscow has been receptive to initiatives that could reduce the economic burden of Cuba. The Soviets worked for several years to arrange an oil swap whereby Venezuela supplied Cuba in 1979 with 10,000 bpd (about 5 percent of total imports). Moscow supplied equal amounts on behalf of Venezuela to European importers, particularly Spain. ..The swap saves the Soviets transport costs (split with Venezuela) but does. not reduce the hard currency burden of foregone exports to the world market. Cuba pays the Soviets only the subsidized price (in sugaj equivalent) for all oil imports, regardless of source. Both the Soviets and Cubans have reportedly discussed similar swaps with other Western hemisphere suppliers, but without conclusion thus far. The Soviets have also urged both Washington and Havana to normalize trade relations in the expectation that restoration of a natural trade link would result in significant (albeit only vaguely perceived) economic gains for Cuba and thereby lessen the Soviet burden. Always hopeful to secure normalization on advantageous terms (i.e. Cuba's), the Soviets have thus far not pressured Havana' to restrain its aggressive international profile. Since the early 1970S, Moscow has been increasingly insistent that Cuban economic managers adopt "principles of scientific socialism." In 1974, Soviet technicians virtually authored Havana's first five-year plan and recently repeated the exercise for the 1981-85 second plan period. Between 1974 and 79 Soviet trade turnover with Cuba rose from 28% to 43% of USSR trade with developing countries worldwide. Moscow may be increasingly concerned that Cuba is absorbing a disproportionate share and thereby retarding the development of Soviet relations and influence in other Third World countries. while Fidel Castro and his colleagues are grateful for the Soviet assistance over the past two decades (without which the Cuban economy and, hence, tne revolution could not have survived), they are also aware of the strings attached. Havana knows that its dependence on Moscow not only carries a degree of inherent control its foreign policy, but also limits options for economic development. They also must be aware that Moscow's "strings" on Havana are likely to tighten, as Soviet aid costs increase. Cuba is fundamentally an economically weak, dependent client of the USSR. That dependence has become increasingly difficult to manage as Havana has found the reliability of its patron sometimes wanting. Deliveries of important raw materials and products have been chronically late and completion of major joint industrial projects lags far .beyond planned objectives. IJn a centralized economy like Cuba, enterprises are often dependent on a single supply source fo'r inputs with the output of one unit preprogranued as the input for another. Disruption in delivery of important supplies from the sole source, therefore, has a widespread impact on economic performance. Castro's now famous December 1979 economic speech provided graphic evidence of the systemic problems in Cuba-USSR trade. As always, Fidel lavished bountiful praise on Moscow's brotherly solidarity in "guaranteeing" access to cheap oil and purchase of expensive sugar. However, he chided the Soviets, and other CMEA trade partners, for failure to meet delivery schedules (e.g. for poultry and timber) thereby forcing the premature slaughter of beef cattle and disrupting housing construction. Said Castro, "we are beginning to believe what happened this year with timber could happen again." Indeed, given the increasingly poor performance of the Soviet economy in meeting its own objectives for domestic industries, Cuba with its inevitably lower priority, seems certain of facing recurring supply shortfalls. Castro also criticized the variety and quality of products available from CMEA, which makes satisfying consumer needs and boosting worker productivity difficult. As the Cuban leadership reviews its development options over the longer term there is little evidence for optimism about the capacity and willingness of the USSR to supply economic aid at levels that do mrrore than meet Cuba's most basic subsistence needs. But never hesitant, Havana will surely keep up the pressure on Moscow. In summary, the Cuban revolution now faces an unprecedented array of economic and political uncertainties. In this atmosphere, the second Party Congress promulgated new initiatives designed to deal with Cuba's economic difficulties. However, effective solutions :ill require more radical departures from past practices than the Cuban leadership has been prepared to undertake thus far. o Diversify access to energy resources. o Improve efficiency and productivity of the domestic economy. o Improve popular living standards. The recent signing of an economic cooperation agreement with the USSR for 1981-85, predicting a doubling of trade over that of the 1976-80 period, and the results of the Second Party Congress, apparently reconfirm Cuba's commitment to seek solutions through further integration in CMEA and dependence on the USSR. However, the key question remains: is Cuba likely to find solutions to its economic problems in the CMEA bloc? Havana's prospects through 1985 are assessed below. Throughout the 1970's Cuban "integration" into CMEA was essentially a euphemism for dependence on the Soviet Union. Eighty-four percent of Cuba's 1978 CMEA trade turnover was with the USSR. (See Table 7). In the past, Cuba's preplanned sugar exports to CMEA at highly subsidized prices have provided an essential cushion against sharp swings in world sugar prices. Indeed, sugar prices have been the determinant of the direction of Cuba trade. When world prices reached a historic high in 1974, trade with CMEA comprised only 52 percent of Cuba's worldwide trade turnover measured on dollar terms. However, during the 1975-79 period of lower sugar prices, Cuba relied on CMEA for up to 72 percent of its trade turnover. Oil is the key to Cuban reliance on the Soviet Union. Soviet oil exports provide 99 percent of Cuban oil needs. Thus, CMEA trade has provided Havana with insurance against disaster. However, because of its fundamental structure, CMEA integration is unlikely to generate the economic growth necessary to provide the average Cuban steady progress toward a better life and thereby insure that the essential political base for the revolution can be maintained over the long term. The key component of Cuba's economic relationship with the USSR is the oil/sugar exchange. In 1980, the USSR supplied Cuba 11.1 million tons ofhoil (225,000 bpd. ), 6.1 in crude and 5 in refined products. Cubah imports accounted for about 14 percent of estimated 1980 Soviet oil exports to the European CMEA countries. Oil imports from the USSR supply 98 percent of Cuba's oil consumption. Small domestic wells supply the residual 2 percent--about 5,000 bpd. Moreover, Soviet oil accounts for three-fourths Cuba's of total energy needs. Oil is the sole power source for electricity, cement and nickel. Alternative energy sources exist only in the sugar industry where cane pulp, or bagasse, which supplies much of the power for Cuba's 150 sugar mills and accounts for an estimated 20 percent of Cuba total energy consumption. Small amounts of natural and manufactured gas as well as hydro resources complete the Cuban energy supply picture. The pricing of Soviet oil shipments to Cuba is an enigma. Cuba is supposedly included in the intra-CMEA pricing mechanism which Soviet bases oil export prices on a five year 1979 moving average of world market prices. Using this method, the price of Soviet oil deliveries to CMEA buyers should have been about $15 a barrel. However, as a result of its preferential developing country status in the CMEA group, according to Fidel Castro in 1979 Cuba paid only $12.80 per barrel, a discount of 13%. for 1979 which is sum of reported country turnovers. reported by Banco Nacional de Cuba. Because of these ambiguities, it is exceedingly difficult to determine Cuba's real cost of imported oil. Nevertheless, using the discounted CMEA price, imports of 11.1 million tons in 1980 cost Cuba the equivalent of $1.03 billion. What seems unambigious, however, is that the sugar/oil swap represents a highly subsidized economic lifeline to Cuba compared to the alternative of filling its oil needs for hard currency, at OPEC prices. The Cuban leadership, at least in public statements clearly expects that the Soviet lifeline will continue. Regardless of the nominal price used, the real burden of oil payments on Cuba is lessened still further by a highly preferential trade pricing mechanism. Essentially, Cuba barters sugar for Soviet oil at prices set in annual bilateral trade negotiations. Since 1974, Moscow has relied on subsidized trade prices, rather than grants and loans, to channel massive economic aid to Havana. As oil prices climb so does the Soviet aid transfer which, calculated at the World price level, reached an estimated $3 billion in 1980. Even more important to Cuba is the fact that the Soviet offered price for preplanned sugar imports is directly linked to the cost of oil exports, thereby affording Havana constant oil/sugar terms of trade. With the rising cost of oil based on the intra CMEA price mechanism, this linkage of sugar and oil prices has been a tremendous economic benefit to Cuba. According to Fidel Castro the U.S.S.R. has "guaranteed" oil shipments of 61 million tons to Cuba in the 1981-85 period. Oil exports to Havana are to rise slowly, reaching 14 million tons in 1985, including 400,000 tons for the new nickel production facility, which is scheduled then to be fully c-, line. Consequently, on line excepting new supplies for nickel, production, Cuba's oil resources in 1985 will be 22 percent above 1980 levels, representing an annual increase of 4 percent over the five year plan period; that is, if guarantees" are kept. Moscow has already cautioned their East European oil clients to expect no increases in deliveries beyond the levels supplied in 1980. The U.S.S.R. also faces growing demands for its own industry, for exports to other LDC allies (Vietnam, Ethiopia, etc.) and most importantly, for exports to the West,. Oil and refined product exports currently provide more than half of total Soviet hard currency export earnings. Facing these multiple constraints Moscow clearly will have to make difficult choices in meeting oil deliveries scheduled for Havana. Cuba publishes little data on the composition of its energy demand. Consequently, a comprehensive energy use profile for all sectors of the economy cannot be constructed. H-.ever, a partial breakdown can be estimated from available information. Approximately 25 percent of Cuban oil is used to power 2,000 megawatts of installed thermoelectric generating capacity. In 1979, Cuba generated 9,400 Gwh of electricity, equal to about one-third the output of New York City's Consolidated Edison Company. Some 70 percent of the electricity provided power to Cuban industry and government services, with only the remaining 30 percent going to household and small farm consumers. While sugar grinding is largely powered by burning sugar cane pulp or baqasse, fuel cil is a necessary catalyst in most sugar mills. In 1980, Cuba's 150 mills consumed 4,000 bpd of oil. With an automobile population of 250,000 (1 for every 40 Cubans) gasoline consumption represents a relatively small part of Cuba's total oil needs. Considering rationed gasoline consumption alone (20 gallons per vehicle per week), Cuban drivers use-the oil equivalent of 12,000 bpd. However, the nonrationed parallel market gas sales probably boosts consumption to 20,000 bpd. Other key industrial users include the nickel industry which consumes 12,000 bpd to process"37,000 tons of niclel. Cuba cement production uses 9,000 bpd for an output of 2.7 million tons of cement. These key sectors account for only about half of the oil resources available to Cubain 1979. The remainder of Cuba's demand for oil based energy includes a variety of uses: fuel for the military, and the large merchant and fishing fleets, for the bus and truck transport fleets, for the railroads, including the extensive rail system servicing the sugar harvest, for production of LPG and kerosene for household use. Available da a does not permit detailed estimates for each of these categories. Neverth 'eless, Cuba's energy consumption patterns appear to be dominated by important users. With household energy consumption already at low levels, the impact of any oil delivery shortfalls on economic activity would be immediate. Timely oil deliveries in scheduled volumes from the USSR will therefore probably be essential to achieve the annual 5 percent economic growth rate called for in the 1981-85 economic plan. Indeed, that goal may be unattainable because it is based on a 50 percent expansion of electrical generating capacity, which is apparently not matched by an appropriate rise in oil supplied to power new plants. Insuring that the Soviets meet delivery schedules for "guaranteed" oil exports is a highest priority for Havana and continued close political and economic alignment with Moscow is clearly a necessary condition (but maybe not a sufficient condition) to the Soviets maintaining the schedule. However, a deepening of Cuban integration into the CMEA bloc will also narrow Havana's already very limited options for dealing with any oil shortfalls that-do occur over the next five years. Because of the massive terms of trade-subsidies that support Soviet oil deliveries, Cuba would face a heavy financial burden if forced to purchase oil on the world market for hard currency. To illustrate, replacing 1980 Soviet deliveries with free market oil at the current OPEC price of $35 a barrel would cost $2.84 billion, $1.8 billion more than the cost from the Soviets and $700 million more than Cuba's estimated record high 1980 hard currency export earnings. Thus, even in years of unusually high sugar prices, Cuba would face an impossible burden in fi.,ancing oil imports, while maintaining other essenti4i imports of food and industrial inputs as well. While Cu ba's vigorous pursuit of improved relations with Mexico, Iraq, and Libya has met some success, none of these countries seem likely to replace Moscow as a concessionary source for oil for Havana. Cuba receives abaut five percent (10,000 bpd) of its oil'1 needs from Venezuela under a swap arrangement involving -the 'U.S -.S.R. and Spain. Oil is available to Cuba under this swap at the same subsidized~price as direct imports from the U.S.S.R., with Moscow paying Venezuela the current world price. However, periodic discussions with Mexico on establishing a similar oil swap arrangement-have not been conclusive and there is little or no prospect of subsidized oil from any source other than the U.S.S.R.
-portion of cane ground compared to 2.1 gallons in 1976. Oil consumption for electric power generation improved to 296 grams of oil per Kwh, compared to 398 grams in 1958, and 314 grams in 1976. Since the bulk of Cuban oil consumption is in key economic sectors, e.g. industrial electric power generation, sugar harvest, transport, etc., further energy conservation measures probably would require substantial capital investments in technical modifications for industry and agriculture. Almost invariably, the know-how and equipment required would not be available in CMEA. Therefore, Cuba's limited hard currency resources, which are a constraint on all Havana's economic options, will likely impede Cuba's energy conservation efforts as well. Cuba has long maintained (but never substantiated) the existence of significant oil resources offshore, but U.S. industry sources generally describe the prospects as marginal. The technology available in CMEA is incapable of exploring or exploiting oil at the offshore depths around Cuba. Havana recently concluded a cooperation agreement with PEMEX, the Mexican oil enterprise, providing for joint exploration. The advanced technology needed for offshore exploration, (and ultimately production) is generally in short supply from non-U.S. sources. PEMEX is unlikely to allocate scarce-resources in search of unpromising prospects for oil near CubA. In a December 1979 speech, Fidel Castro noted that "a substantial portion of Cuban electricity would be produced by nuclear plants in the futu.re". However, that future seems distant. In 1972, the Soviets agreed to construct two 440 megawatt nuclear power stations in Cuba. When (if?) completed, these two units would provide the equivalent of 40 percent of Cuba's 1980 installed capacity. However, work on the first plant has been plagued by numerous technical problems, probably compounded by the lower priority afforded the Cuban project than to the highly ambitious nuclear development program underway in the European CMEA countries. As a result the first 440 megawatt reactor (equal to 20 percent of Cuba's 1980 capacity) is not expected on line until the late 1980's. Installed nuclear thus is unlikely to be available during the crucial mid-1980s when Soviet oil availability is likely to be most unreliable. Cuba .ould seem to be ideal for biomass energy development. Sugarcne is by far the most efficient raw material for producing ethyl alcohol which could supplement Cuban gasoline and diesel consumption. However, limited investment capital would be a key constraint on expanding Cuba's annual alcohol output of 770,000 liters. Additional resources are not likely to be provided by Moscow and hard currency resources are already overcommitted to other investment needs. The conclusion seems clear that, assuming no change in Cuba's pervasive economic orientation to CMEA, Havana has essentially no viable alternative to continued dependence on Soviet supplied oil. However, the outlook for CMEA energy is uncertain and any shortfalls in Soviet deliveries would have serious affects on Cuban economic activity and living standards. The key principle of CMEA economic integration has been to promote "international specialization", accomplished through coordination of economic development plans and by targeting investment and economic aid to those sectors in which each economy has a comparative advantage. The end result for Cuba has been a heavy concentration of investment and aid in traditional industries, especially sugar, nickel and citrus. The only essentially new industry developed under CMEA auspices is the fishing fleet. Although production in each of these k-y sectors has expanded beyond prerevolution levels, Havana's historical dependence on sugar has in fact increased. Sugar and its derivatives now account for 83 percent of Cuba's exports worldwide compared to 80 percent before the revolution. The European CMEA countries imported 63 percent of Cuba's sugar production since 1975 (see Table 8). The USSR is the world's largest sugar producer and all the East European countries produce at least some sugar. Consequently, CMEA demand for Cuban sugar varies with swings in domestic production. When not consumed, excess imports from Cuba have usually been resold on world markets. In 1980, poor crops in Cuba and the USSR have forced the Soviets to import more than 3 million tons from the world market in addition to about 3 million tons from Cuba. Reflecting a continued commitment to reliance on sugar, Havana has announced plans to boost production in stages to 10 million tons by 19A5. Accomplishing what would be a 50 percent increase over average output of 6.5 million achieved in 1974-79 will be difficult, though not impossible. However, finding export markets will be another story. Sugar supply and demand are likely to return to basic balance, if not in the 1980-81 crop cycle, then shortly after as a result of increased world sugar production, worldwide consumer price resistance, and the switch to alternative sweeteners (e.g. fructose). The pressure toward lower prices will only be marginally offset by increased use of sugar cane for ethyl alcohol production. 1.5-2 percent yearly to 1985. Cuban production of 10 million tons by 1985 would represent annual increases of 6.6 percent in Cuban output. To expand exports, Havana will have to find new makes as well as increase Cuba's share of new existing markets, both difficult tasks made more so if the large U.S. market is still foreclosed. Soviet requirements faCuban sugar through 1985 are not likely to exceed the annual average 3.8 million tons imported in 1977-79. Indeed, the 1981-85 Cuban-Soviet agreement calls for yearly exports of 3.5 million tons. Moreover, as sugar prices decline, maintaining Cuba's terms-of-trade for Soviet oil stable will require Moscow to continue to increase sugar price subsidies. Otherwise, Cuba will face the prospect of reduced imports of Soviet nonoil products. Thus, Havana's interest in expanding sugar exports to the USSR could decline if other markets can be found. In 1980 Mexico for the first time became a major importer as Cuban exports reached 400,000 tons. but purchases declined in 1981. Among Cuba's customers, only Japan and Mexico offer substantial potential for expanding imports of sugar. However, high sugar prices have once again again stimulated Japanese interest in boosting frustose production, while a recovery of Mexican sugar production must be anticipated. Cuba also faces a key multilateral constraint on its hard currency sugar exports; the International Sugar Agreement (ISA), which Havana helped design to restrict free market price swings through use of buffer stocks and export quotas. Under the ISA, Cuba's exports to free world markets are usually limited to 2.8 million tons. -When high prices have exceeded the ISA ceiling, allowing quotas to be suspended, open competition thus prevails in world sugar trade. However, market equilibrium prices are likely to be within the ISA range during much of the 1981-85 period. Consequently, Cuba would face a difficult task in finding new hard currency markets for an additional 2.5 million tons, if its production goals are met. to the wide price swings of the past. Aside from sugar, CMEA development strategy as implemented in Cuba will continue to emphasize the nickel and citrus industries. Since Cuba has little to offer beside sugar, both products are welcomed by Cuba's CMEA trade partners in balancing, at least partly, their trade flows. With Soviet and East European assistance, nickel production is being expanded from the current capacity of 38,000 tons to a goal of 70,000 tons by 1985. Approximately 75 percent of current production is exported to CMEA and half of the planned additional output is reportedly committed to repay investments. Thus, by 1985 Cuba could have a total of about 23 tons available for HC exports, about three times present capacity. Cuba's nickel industry is based on two pre-revolution U.S.-built plants which, although substantially renovated by the Soviets, continue to be only marginally efficient by world industry standards. Both employ energy intensive processes for extracting nickel. The new Punta Gorda plant, under construction with Soviet assistance, will reportedly be more efficient than the existing plants but has been plagued by long delays and is unlikely to employ the most up-to-date technology and will likely be a heavy oil consumer. -1/ China supplied 35% of Cuban rice imports in 1976. Source: Anuario Statistico de Cuba. -w in the development stace, the future economic viability of Cuba'! nickel industry -ay well be limited. itrus production has remained stagnant at between 180-190,000 tons, and the production goal of 350,000 tons by 1980 clearly has not been met Although substantial i-vestments have been made in infrastructure for the industry, the quality of Cuban citrus has failed to meet world market standards. Consequently, virtually the entire e:-xpDort crop continues to be shipped to CMEA, especially the USSR, where chronic shortages always guarantee a market. Without further investment, technical assistance and specialized equipment, generally available only in the West, export markets will remain limited to CMEA. CMEA countries have not developed Cuba's traditional advantage in tourism. The USSR and Eastern Europe have themselves relied heavily on Western companies for investment and know-how in building tourism industries that meet world class standards. Cuba must therefore turn elsewhere for aid in developing its potential comparative advantage in this key service sector. Havana's primary tourism market is the U.S., but U.S. tourism to Cuba will continue to be constrained by the absence of normal relations and political tensions. The outlook for Cuban imports from CMEA is not much more promising. Continuing past export patterns will insure chronic constraints on hard currency earnings and thus dependence on CMEA, particularly the USSR, for the bulk of essential imports. (See Table 9.) Prospects for expanding past import volumes are not good. The Soviets supply the bulk of Cuban food imports, either directly (e.g. dry milk) or from third countries on Soviet account, (e.g. wheat an.d flour from Canada). Faced with increased need to import Western food supplies for its own population, Moscow is likely to strongly resist Cuban demands for more food aid. The Soviets are able to supply only a portion of the raw material and intermediate products imported by Cuban industries. Szme key new plants, such as textiles, which Cuba has counted on for both dcmestic supply and exports, require substantial imported inouts from the West. discontent was reported to be the discovery c ; rec meat products destined for Cuba, under fa.ke labels as non-mea -:;, in this environment, Cuba's baraair'n position for imports of consumer goods and food commodities faces continued erosion. Havana will have to rely, more than ever, on Moscow's "encouragement" of Eastern Europe to supply needed products to Cuba. However, traditional arguments based on the Cuba's special needs as a less developed CMEA member are unlikely to be as persuasive as in the past. -eal burden on Cuba is likely to be relatively small, though it will, nonetheless constitute a drain on Havana's always limited resources. Further political and economic integration into CMEA will also insure continuation of the heavy burden of Cuba's hard currency debt, estimated at $2.6 billion in 1980. Assuming Havana was successful in rolling over all principal payments falling due, more than $200 million in interest charges alone were probably paid in 1980. In order to pay interest and reduce outstanding debt principal, Cu~a would have to maintain a substantial surplus in its overall hard currency balance of trade, an unlikely possibility over the next five years assuming no change in the current trade orientation to' CMEA. With an even closer Havana identification with Moscow, Western banks and governments are unlikely to significantly increase lending to Cuba, though they may continue rolling over current debts. Thus, for the forseeable future, Cuba's hard currency import potential will be determined almost solely by its export earnings plus any hard currency loans or grants Havana can squeeze from CMEA, less interest due on debts to the West. But, with the exception of a modest sugar windfall in 1980-81, Cuba's hard currency export ...... prospects through 1985 are not very attractive under a lose CMEA alignment. industrialized countries. In this environment, Cuba's prospects for gaining access to the large U.S. export market are extremely dim. Moreover, continuation ,of the U.S. embargo will also significantly hamper Cuba's possibilities for expanding trade with other Western countries. Perhaps most important for the long term, Cuba's possibilities for direct investment to develop new industries will be extremely limited, since their viability would likely depend on direct export access to the massive U.S. market. Further integration into CMEA is, therefore, unlikely to allow substantial change in either the composition or flow patterns of Cuban hard currency exports. Consequently, swings in the price of sugar will continue to be the key determinant of hard currency income and, as in the past, will constrain the pace and increase the uncertainty of overall economic development. Although the resulting volatility makes projecting Cuban hard currency trade difficult, the following calculations illustrate the parameters Cuba faces barring a switch from its trade orientation to CMEA. Record high sugar prices in 1975 were primarily responsible for peak export earnings of $1.6 billion in 1975 (see table 10). But export and import growth rates over the 1975-79 period were actually negative (-2.3 and -2.2 percent respectively) as Cuba shifted its trade toward CMEA after 1975. Given Cuba's already large hard currency debt (2.7 billion, or 3 times its 1979 hard currency exports), future hard currency imports must closely parallel an export performance that is likely to be erratic, mirroring sugar price swings. Table 10 provides illustrative import growth rates and matching export growth rates that would-be required to stem growth in hard currency debt For example, were hard currency imports to grow to 10 percent annkially in nominal terms, exports would have to grow at 16.4 percent to stabilize debt at $3.0 billion by the end of 1983. The required 1983 export level of $1.6 billion, would necessitate exports of 2.5-3 million tons of sugar at 19 to 23 cents per pound. While exports and prices in or above this range are likely to be achieved or surpassed in 1980-81, such favorable market conditions are unlikely to persist over the multi-year period required for Cuba to stem growth of its debt while increasing imports 10 percent annually through 1983. In view of Cuba's negative 2.3 percent export performance over the 1975-79 period, optimism is not justified. But is even a 10 percent import growth adequate to meet the needs of Cubans industry and consumer? Compared to the dismal -1.4 percent rate of 1975-79, it would appear to be. However, the adverse impact on living standards of that negative growth rate was probably offset by a 15 percent annual increase in the value of imports from CMEA. In particular, the steady rise in subsidized food imports from the Y3SR preserved popular consumption at minimal levels. Considering the economic difficulties confronting the East European countries, future similar vol-zes of food imports at these levels from CMEA would seem doubtful.. In summary, under a regime of continued integration into CMEA, the outlook for Cuban hard currency trade is bleak. The export growth rates required to finance adequate import levels and manage the external debt burden are unlikely to be consistently achieved. Can Soviet style central planning accomplish these objectives for the Cuban conomy? After 10 years of application, is the Soviet model adaptable to a small developing economy, highly dependent on foreign trade? Characterizing Cuba as a centrally planned economy prior to 1974 was largely a sham. Although multilayered bureaucratic organizations had been created, effective control of operating enterprises was only rarely achieved in a few key operating enterprises. Things began to change in 1974-76 as Havana planners drew up the first comprehensive five year plan, under the close tutoring of Soviet technocrats. As an adjunct to the.plan, beginning in 1977, a new system of economic management (calculo economio) was imposed to enforce cost accounting and meaningful economic profitability standards on enterprise managers. Subsequent changes included funding enterprise operations with interest-bearing central bank loans, rather than nonrepayable national budget grants; salary reforms that tied pay directly to productivity and, most recently, granting substantial hire and fire autonomy to many enterprise managers. Similar trends in decentralizing economic administration were reflected in the opening of free farmers markets in April 1930 to overcome chronic inefficiencies in the state run food distribution system. Most of the reforms Cuba is now im-lementino have been tied in the Soviet economy, generally with unsatisfacto0y results. In contrast, some of the smaller East European econe-.is, esec l zhos s heavily dependent cn forcic trade wi:h the Wast, huve beer, far more successful in promoting eccnoric efficiency through decentralized management. In most cases, the key mechanism for economic administration is the price system. Enterprise managers must be guided by realistic, flexible prices that both reflect the cost of resources and respond to changes in market supply and demand. In the Soviet Union, the failure to modify the system of centralized price administration has limited the impact of economic reforms. Managers continue to respond only to administrative directives which cannot mandate the most efficient allocation of resources. For the open Cuban economy (trade is 70 percent of GDP) effective internal prices must directly reflect world market prices. As long as more than three-fourth or more of its trade is conducted within CMEA, on the basis of preplanned delivery of physical quantities at fixed and subsidized prices, Cuba seems destined to repeat Soviet failures in attempts at economic reform. Even the best technocrats in Havana's State Committee on Prices are unlikely to succeed in providing enterprise managers and consumers with the price signals they need to make efficient decisions in allocating resources. Cuba's foreign trade planners face mounting difficulties that go beyond the inadequacy in quantity and quality of products available from its CMEA trade partners. In addition to pricing problems, intra-CMEA trade is plagued by inefficiencies which have cost the Cubans heavy, though unquantifiable losses. As in the most CPEs, Cuban foreign trade is controlled by a central ministry, with 40 importing and exporting enterprises operating on the basis of pre-set targets in the annual trade plan. Management of intra-CMEA trade involves little flexibility once delivery volumes and terms are set in annual agreements with each trade partner country. There is little a trading enterprise can do to overcome the substantial delivery delays that are endemic in intra-CMEA trade. In contrast, managing Cuban hard currency trade, where key export and import products are dependent on volatile commodities markets, often requires a rapid response to world market developments to make the most efficient use of scarce hard currency resources. Dealing with both markets simultaneously has caused expensive foul-ups for Cuban trading enterprises. For example, anticipating continued high sugar earnings in 1975-76, Havana's traders seriously overextended commitments for hard currency imports, necessitating contract cancellations and disruption of trade f2;,ws. inzerrupted due to recurrin shortages of import Items and, as a result, the availability of consi--er products--even rationed necessities--has been haphazard. These systemic problems have also been greatly exacerbated by Cuba's inability to trade with its closest natural trading partner, the U.S., which could be an efficient supplier of virtually everything Cuba imports and a ready market for its exports. A key factor in improving efficiency in the Cuban economy is more productive use of a relatively well-educated labor force that is growing rapidly. Prior to the 1980 Mariel exodus, overt unemployment reached an estimated 6 percent. But Cuba's employment dilemma is even more serious given the of pervasive underemployment of labor in marginally productive jobs and the counterproductive, pervasive administrative bureaucracy. Over the next few years, Cuba will confront serious structural unemployment because the predominantly agriculture based economy is increasingly unable to generate the white collar, technical jobs expected by the growing army of graduates from an impressive education system. Technical and professional student enrollment reached 220,000 in 1980 and youths now view a higher education as virtually an entitlement to, as well as a prerequisite for, attractive employment. In addition, the economy must absorb large numbers of youths who expect favored placement on completing their required military or "internationalist" service. Cuba's labor problems may also be aggravated by recent economic reforms. To promote efficiency, enterprise managers are being allowed new autonomy in deployment of labor resources, including hire/fire authority and salaries linked to productivity. As a result, managers will have direct incentives to economise on labor and eliminate marginal jobs precisely when structural unemployment and underemployment are growing problems. The kind of employment required by Cuba's growing labor force seems most unlikely to be generated by further integration in the CMEA system. The concentration of CMEA supplied investments in sectors where Cuba has a comparative advantage vis-a-vis the other CMEA countries will perpetuate the reliance on traditional industries, e.g. sugar, nickel, and citrus, where technical and skilled jobs comprise only a small portion of total employment. Fidel Castro has suggested another possibility--exporting labor to the chronically labor-short CMEA countries, especially the U.S.S.R. Plans are reportedly underway to send 10,000 Cubans to Siberia to cut timber for export to Cuba. They would join the estimated 7-10,000 Cubans already working in European CMEA countries. If Cuba actually becomes substantial source of "gastarbeiters" for CMEA, the economic gains to Cuba are likely to prove marginal. CMEA countries will pay for Cuban labor "in kind" through bilateral trade flows, and as always, they will be reluctant to export high quality products that are already short at home. In particular, the food and consumer goods Cuba needs are the most unlikely forms of payment for labor supplied to CMEA. In the case of Soviet timber, sending Cubans to Siberia is unlikely to provide any added assurance of delivery on future export contracts because the bottleneck is the inadequate Soviet transport system, rather than a shortage of able-body laborers or axes! The establishment of new labor-intensive manufacturing industries would appear to be the only effective long-term solution to Cuba's unemployment problems. If production were high quality, such industries could also lead diversification and growth in exports to both hard currency and CMEA markets. However, the CMEA development program offers little prospect for investment in the kinds of industries capable of utilizing Cuba's labor resources. All CMEA members are striving to develop their own high quality export industries, but with few exceptions, they lack the technology, the organization and the incentive systems required for success. The average Cuban's material well-being improved during the 1960s as income was redistributed by the new revolution. However, GNP growth in real terms during the 1970s averaged only 2.5-3 percent, or about I percent per capita. Moreover, this slow growth has been uneven with the result that current availability of consumer staples, e.g. sugar, rice, beef, and coffee, clothing, is less than in 1970. (Table 11). Havana also has not been able to maintain existing housing, much less accomplish ambitious goals for new construction. The social impact of slow economic growth in the 1970s was partly mitigated by an implicit "social compact", between the Cuban leadership and population based on a highly egalitarian income distribution and (more or less) guaranteed availability of necessities at highly subsidized prices. Over the last decade salaries have been tied to skill levels and currently range from 200 pesos .monthly for common labor to 450 for top professionals. Food and basic consumer items have been rationed at low prices, and utilities, rent, transport, medical care, and education have been highly subsidized or provided free. However, over time Cuba's "social compact" based on austerity shared equally, has had a perverse effect on economic performance. Labor motivation has been retarded and hobbled the economy with low productivity and chronic absenteeism. These problems worsened in the 1970s, prompting direct attention of the leadership. In 1979, both Fidel and Raul Castro publically blasted inefficiency, mismanagement, and cronyism. In November, a reshuffle of key economic ministries was carried out, followed by salary reforms to increase differentials and link pay more closely with productivity. More importantly, however, the "social compact has been eroded as consumer goods have been moved from rationed to "parallel" markets where larger quantities can be bought, albeit at very high prices. The change has been substantial. (See Table 12). In 1970, 94 percent of the 274 types of consumer goods available were rationed, but by 1980, only 21 percent of 874 products were controlled. The new free farmers markets, set up in April 1980, have accelerated the trend away from rationing. While these economic reforms indicate.pragmatism and a lack of rigid commitment to Soviet style management on the part of the Cuban leadership, chances for success remain uncertain. The outlook for Cuban consumers, assuming further integration into CMEA, is equally unclear. tolerated. Consequently, the new real income incentives and higher food production are not like to be sustained. * Cuba is, therefore, unlikely to achieve self-sufficiency in food production and will remain dependent on CMEA (and hard currency) imports for at least one-third of essential foodstuffs. The USSR supplies virtually all Cuban needs for wheat, flour, corn, rice, and lard. (See Table 9). However, since all these products are either in short supply or not grown in the USSR, Moscow has had to procure supplies for Cuba from world markets. Feeding Cubans cost Moscow an estimated $200 million in hard currency in 1979. Confronting food shortages of its own in 1980 and possibly beyond, Soviet willingness to continue subsidizing Cuban consumption at levels already approaching that of the average Russian (2800 vs. 3300 calories) could diminish. Moreover, in the wake of recent events in Poland, East European countries will probably be even more reluctant than usual to continue subsidizing Cuban consumption. in 1974-79. With h -ontinued reliance on CMEA and sugar hard currency earnings to finance imports of food and consumer goods, a replay seems inevitable. Cuba's economic integration into CMEA, begun in earnest in 1972, provided an essential underpinning that made possible significant social advances. However, the availability from CMEA of raw materials and other imports--especially energy--at heavily subsidized pirces has allowed Cuba to pursue economic development with little concern for the efficient use of resources. *In his speech to the Party Congress, Castro noted a new tax system for peasants is "under consideration." will continue to condemn Cuba to a stop-go cycle of economic development, inevitably linked to volatile swings in world sugar markets. Consequently, CMEA aid. may continue to protect the Cuban revolution from economic disaster, but only just. For the average Cuban, the outlook is for more austerity--perhaps interrupted by small periodic advances when the sugar price swings upward. On the other hand, if shortfalls occur in Soviet energy supplies, an austerity scenario will prove to be the best outcome Havana can anticipate.